Video: CCTV footage of the festivities in the main street of Swakopmund and the high speed crash about three hours later. The st3ills pictures shows the aftermath of the crash. A WILD party in Swakopmund on Thursday ended when the driver of a four wheel drive vehicle the purportedly belonging to the Office of the Prime Minister crashed into the consulting rooms of well known veterinarian clinic in town. According to members of the Swakopmund Neighbourhood Watch the traffic department of the Namibian Police was called at around 01:00 on Friday morning when the vehicle with registration plate number GRN 4921 made a ‘pitstop’ in the Sam Nujoma Drive, the main street of the holiday town. The driver then got back behind the wheels and left the scene but must have parked somewhere else because they were not seen again until about three hours later at around 04:25 when the driver skipped a three way stop street at the junction of Garnison Street and Mandume Ndemufayo Street and crashing into the Veterinary clinic building not far from the town’s main police station. 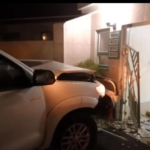 The crash happened at a very high speed and vehicle slammed into the veterinarian’s consulting rooms near the Swakopmund Super Spar damaging the main entrance to the building and wrecking the Toyota double cab bakkie. Neither the driver nor any of the other occupants of the vehicle were seriously injured but a breathalyzer test for alcohol confirmed that the driver was well over the legal limit. The man was arrested on the spot and will make his first appearance on the charges of driving under the influence of an intoxicating substance as well as reckless and negligent driving on Monday.